Here is the other pumpkin bread I am featuring during October at the bakery. 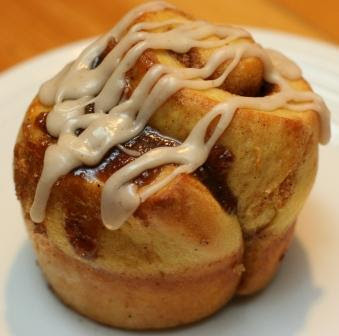 This is a variation of the lemon currant rolls made with a sweet pumpkin dough and a filling reminiscent of pumpkin pie. I made a batch for Vegan Mom's Greening Committe meeting and they met with the approval of all in attendance. I have a feeling they will willing volunteer to test any future experimentations. 1. Dissolve yeast and sugar in warm water in a large bowl. Set aside to proof. 2. While yeast is proofing, warm soymilk, margarine tofu, and pumpkin gently on stove in a medium saucepan, until margarine is melted. Blend with a hand blender, or in a food processor until smooth. 3. Mix together flour, sugar, and salt in a separate bowl. Fold dry ingredients into liquid ingredients. 4. Turn onto a floured surface and knead until smooth. Shape into a ball and place in a bowl greased with margarine. Turn to coat thoroughly. Cover and let rest in a warm place until doubled in size. 5. Make filling and set aside. 6. Preheat oven to 350F (180C). Turn dough onto a lightly floured surface and roll into a large rectangle measuring 10"x 36". 7. Spread filling evenly over the dough and roll dough into a long cylinder along the long side (i.e. you will have a 36" cylinder. 8. Cut dough into 12 pieces, measuring 3" each. Place each piece in large muffins tins (you will need two tins). 9. Bake for 18-22 mins, until golden. Cool in tins on racks. 10. In a small saucepan heat soy creamer over med-lo heat. Add icing sugar and spices, stirring until sugar dissolves. Drizzle over slightly warm rolls.